My wandering eye is a series reacting to the crazy rising prices in the bourbon world. We’ve reached a place where even average products have hit the range where they compete price-wise with other types of aged spirits. If I’m going be asked to drop $40 to $70 on a mid-range bourbon, I might as well see what else I can get for that money. See if another spirits category offers something that is downright tasty in that price range. The goal isn’t to find cheap spirits, but to maximize the quality, I’m getting at a particular price point. So. Yes. I'm back on the rum train today, mostly because that's what I've been drinking since I got back to Minnesota. On January first, I went from 73 degrees Fahrenheit in Miami to -12 in Minneapolis a few hours later. A negative swing of 85 degrees. I haven't been warm since. I experienced it and still can't really comprehend it. But to try to pretend that warmth is a thing that still exists in the world, I drank a lot of rum. A drink I associate with warm places now. So an Old Fashioned is basically the easiest drink you can make. You put the bitters in your glass. Add the simple syrup. I felt that the rum, in this case, was plenty sweet, so I didn't add a lot. Add the rum and however much ice you like. The final touch really helps this one though. You need to express the oils of an orange peel over the drink, rub it around the inner and outer edges of the glass, and drop it in. In this case, the hint of orange makes the drink. Details: 38% ABV. 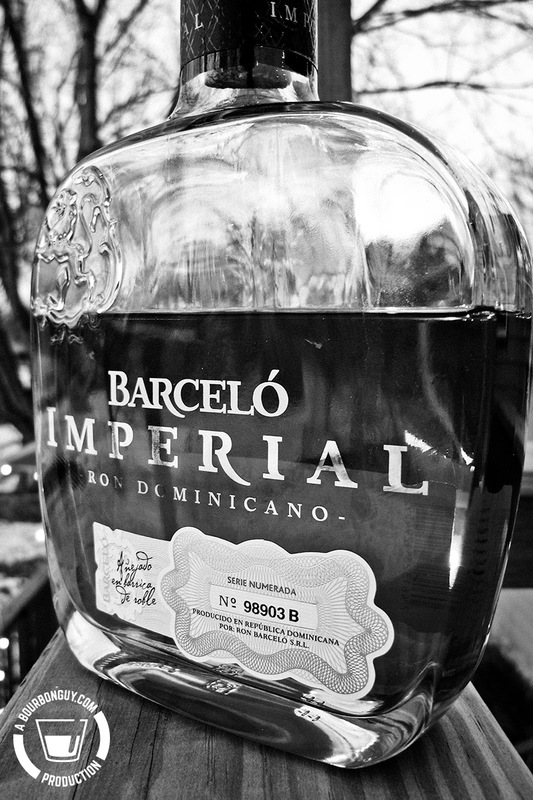 Made in San Pedro de Macoris, Dominican Republic. Nose: Molasses, oak and faint citrus notes. Mouth: Brown sugar and black cherry notes predominate with baking spice along the sides of the tongue. Finish: On the gentle side of medium with lingering brown sugar, black cherry, and nutmeg notes. Thoughts: For me, this is too sweet to drink neat. I love it in an Old Fashioned though. Using the recipe above, I think I love it better than a whiskey Old Fashioned (though to be fair, I have never thought of an Old Fashioned as my favorite whiskey cocktail). I'm going to say here that the average of loving it in a cocktail and finding it a bit meh neat will be that I like it. And since mine is now empty (I've been rebelling against Dry January), I'll need to pick up another bottle soon. I don't make a lot of cocktails. Wait, check that. I make a ton of cocktails, they just all happen to be a variation of the Manhattan. And over the course of the last couple years, I've been trying to expand my horizons. Which is why last year when Sazerac launched the Mr. Boston site, I bookmarked it. And then waited a year to remember that I had done so. Last week, I was cleaning up my bookmarks when I remembered it was there. Of course, this seemed like a great excuse to put it through its paces and see if I could find anything interesting. According to Wikipedia, Mr. Boston was started as a distillery in, you guessed it, Boston in 1933. Within a few years, they were publishing their Mr. Boston Official Bartender's Guide to help promote their products. For the next 77 years, the company and its various owners published the book with the last edition being published in 2012. In 2009, Sazerac bought the brand and its guide as part of their purchase of the Barton Distillery and brands. According to the company, they immediately started working on bringing the venerable old publication into the modern age by putting it online. And this is the part that I find pretty cool. They have digitized the records of every edition they could lay their hands on. That means, if a drink was in multiple editions, you can swap back and forth between the editions to see how the recipe has changed over time. I find that pretty cool and is a step that many companies wouldn't have bothered to take since it probably took a lot of extra time and money to accomplish. So is the site any good? Yeah. I love it. It's designed with a cool Art Deco feel that is very appropriate for a site that celebrates a history that goes back to when Art Deco was cool the first time. It is easy to use both on the desktop and on your phone. The directions come with an image of the glass you might want to use and a difficulty level so that you know what you are getting into. You can search for recipes by ingredient or name or you can use a "Discover" option that allows you to find recipes based on an event or occasion. If you log in, using Facebook or Google, you can save your favorites and even add your own recipes. While doing research over the last week or so, I decided to try as many new cocktails as I could find. I have limited ingredients in the house and even so, I was able to find more than I had time to drink. I even learned that my homemade cranberry juice goes well with bourbon. I have a feeling that I am going to be keeping this particular bookmark and trying a lot of new options. It really is amazing what you find when you clean your office. A little over a week ago, I got fed up with the disorganized mess that used to be my office. When I realized that I had started to record my monthly (ish) Patreon video in another room, I decided that the time had come to bring it back to a less stressful level of disorder. As I was cleaning, I found something that I received on a visit to a local craft distiller that I took with a couple of friends. It's an Oak Infusion Spiral created by The Barrel Mill here in Minnesota. He was talking about some failed experiments that he had tried and held one up. Since he wasn't using it, he asked if we wanted them. There were three of them and three of us, so we all said yes. Upon returning home, I promptly set mine on one of my desks and proceeded to let the sediment of time cover it in a pile of papers, notebooks, and folders. So when I found it last week, I was anxious to do something with it. While I have almost no desire to add it directly to a bottle of spirits, I did have a couple of ideas of what to do with it. I was in the process of making a batch of orange bitters and tossed half of it in there while the liquid rested. To be honest, I never thought to do a control batch on that, so I have no idea if it helped, hurt or did nothing. The main question I wanted to answer was: does this thing do anything? The answer to that is yes. The Manhattan with the oak spiral is noticeably silkier and is better integrated than the freshly made one that I am having next to it. So that's it. The stick does the trick. Or does it? Oaked versus fresh doesn't really tell you if it was the time it sat or the spiral doing the work. To answer that, I tried the 10-day-old oaked one next to the 10-day-old non-oaked one. To be honest, I expected that there would be little difference between the two since there wasn't a noticeable "oakier" flavor in the bottle with the stick versus the freshly made drink. But there was a huge difference. The non-oaked version might be the worst Manhattan I've ever had. It basically tastes like I used old ingredients. To sum up, I can't say if this will help your whiskey should you stick it in the bottle. But it might help your cocktails. Just don't try to use it with ones that use non-spirit ingredients to minimize spoilage.